W. A. Cole 5 String Banjo (1892), made in Boston, Mass., serial # 190, black varnish finish, half-spun maple rim, mahogany neck with ebony fingerboard, grey chipboard case. This is a nice example of an early-production Cole banjo dating to the first years after Cole's splitting with his partner Fairbanks. It is a fairly simple design but does have some lovely shaped pearl inlay in the fingerboard. This lower-grade model does not have the Eclipse tone ring or elegant teardrop bracket shoes, but otherwise is structurally similar to the famous Eclipse models. Some signature Cole features are present, including the unique "boat" shaped heel, the patent neck angle adjustor and half-spun black painted maple rim. The dowel is stamped "W.A.Cole Maker Boston Mass" and carries serial # 190. When W.A. Cole left the Fairbanks & Cole company in 1890, he quickly launched his own banjo making operation...across the street from his old partner! The Eclipse line created there rank among the most interesting and artistic banjos of the late 19th century, but all Cole banjos are very nicely made regardless of grade. This instrument would have been one of Cole's lower grade models at the time but is still a very high quality instrument. 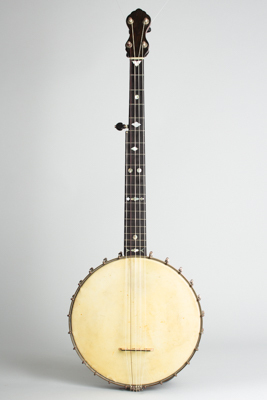 This banjo is set up with Nylgut classical strings and a vintage "Ludwig & Ludwig selected quality" skin head from the 1910's or '20's, unusually mounted with the tuck on the underside but still great sounding. It is a delightful instrument from one of the late 19th century's most elegant and distinctive builders. Overall length is 33 5/8 in. (85.4 cm. ), 11 in. (27.9 cm.) diameter head, and 2 1/4 in. (5.7 cm.) in depth, measured at side of rim. Scale length is 25 in. (635 mm.). Width of nut is 1 3/16 in. (30 mm.). This banjo remains practically all original, showing a decent amount of use but mostly the wear of a long time stored in less than ideal conditions. There is a lot of wear to the plating, which is largely gone down to the metal on much of the hoop and many of the hooks and nuts. The finish on the wood is better preserved with just some gently worn areas, and the frets and fingerboard have hardly any wear. All hardware appears original (except one hook and a new bone nut) including the patented Champion pegs, Elite tailpiece and Cole neck setting hardware. The neck is not absolutely straight but the banjo plays well with Nylgut strings with a lovely authentic 19th century sound. Very Good + Condition.